As a university that recognizes and appreciates diversity, UCSF strives to create an inclusive environment for all of our community members. It is important to offer opportunities for all members to share their gender pronouns in settings where they are asked to introduce themselves. Whether you are working with a colleague, peer, or patient – we want to allow for everyone to specifically indicate their pronouns so each individual feels safe navigating UCSF. These stickers aim to reduce instances of misgendering and to make it easier for you to know which pronouns to use for someone you just met, especially if you are not sure about their correct gender pronouns. 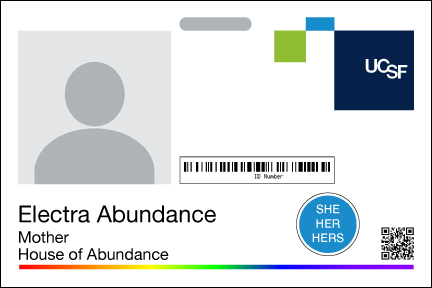 We encourage everyone to add a pronoun sticker to your UCSF ID badge. Stickers are available in the LGBT Resource Center located at MU108W.